At fewer than 140 calories each, this appetizer won't spoil your dinner. 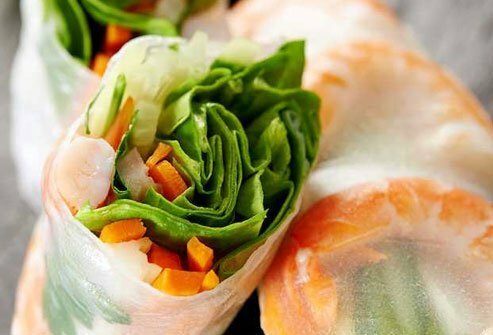 Summer rolls feature a medley of veggies, including lettuce, carrots, and cucumber, along with noodles and shrimp. That's all wrapped in a rice-paper skin. Have one roll and skip the dipping sauce, which tacks on extra sodium and sugar. Can't find them on the menu? They’re also called fresh spring rolls. Sure, they're filled with cabbage and carrots, but those veggies are stuffed into a flour wrapper, then deep-fried in oil. The result: Each small roll can pack in roughly 130 calories and 6 grams of fat. And that doesn't include the sugary dipping sauce. Polish off an order of four, and you'll take in an entire meal's worth of calories. Start your meal with a serving of fruits and veggies. The main ingredient in this salad is crisp green, or unripe, papaya. One cup serves up 3 grams of fiber and more than all the immune-boosting vitamin C you need in a day. This shredded fruit is tossed with green beans and tomatoes. Peanuts add crunch, along with protein and heart-healthy unsaturated fat. 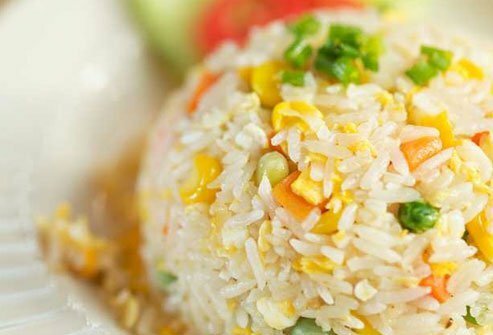 This rice doesn't have much fiber, and that can leave you feeling tired and hungry. Order the steamed brown rice instead. Research shows that eating plenty of whole grains, such as brown rice, can lower your chances of type 2 diabetes, heart disease, and cancer. Satays are skewers of grilled, marinated meat. Opt for the chicken, and you'll score a low-fat dish that's high in protein. 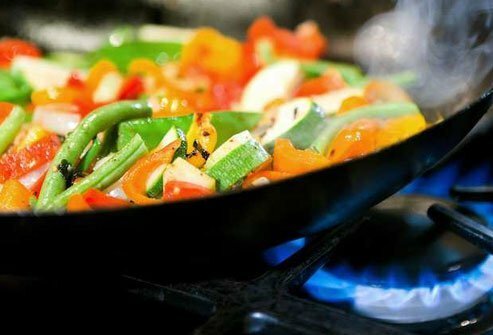 That can help fend off hunger and set the stage for weight loss. 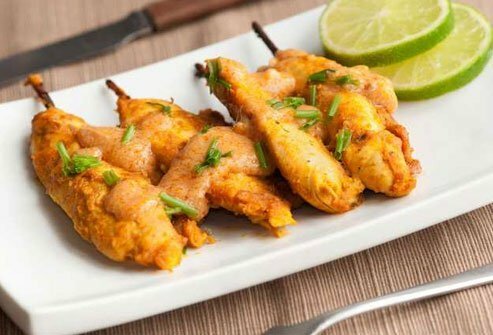 Satays are usually served with a spicy-sweet peanut sauce. Instead of dunking each skewer, put a little on your plate. Two tablespoons of the sauce serve up 80 calories and nearly 10% of all the sodium you should get in a day. 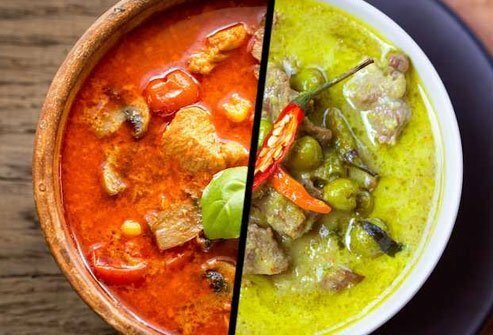 Thai curries are usually made with a hefty dose of coconut milk, and that won't do your diet any favors. One cup of the creamy milk packs in 445 calories. It also has 43 grams of saturated fat -- more than three times the recommended daily amount. For a healthier dish, order the grilled or barbecued curry chicken. The scoop on this hot-and-sour soup? It's a healthy pick. Tom yum has fewer than 100 calories per cup. It also has shrimp, veggies, and fragrant spices, such as lemongrass. 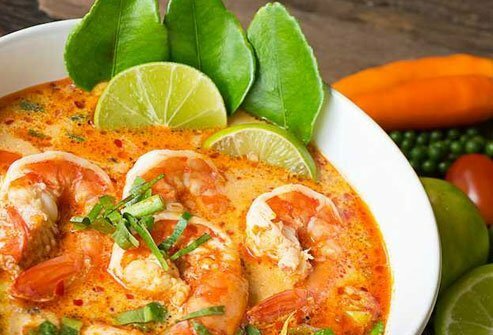 Tom yum and other broth-based soups, like tofu-vegetable or wonton, are usually lower in fat and calories than soups made with coconut milk, such as tom kha. 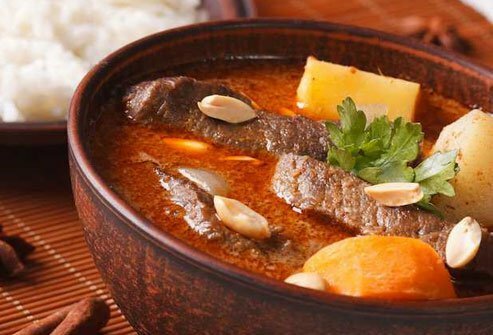 Like its red and green counterparts, massaman curry gets its creaminess from coconut milk. But this version is made with peanuts and potatoes, so it's often higher in calories. One cup can have more calories than a cheeseburger and fries -- and twice as much fat. And that doesn't include the side of rice that comes with it. It may be a salad, but this dish can be a satisfying meal. It's made with protein-packed minced chicken with cilantro, mint, onions, and chili peppers. And all that's tossed in a lime juice dressing. 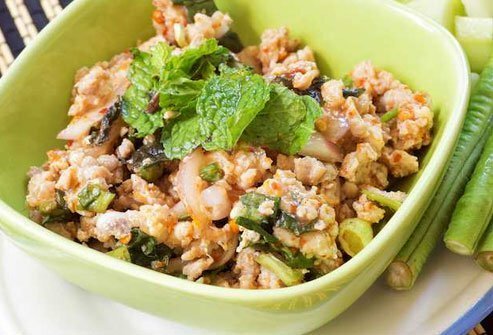 Larb is often served with sticky white rice and lettuce. Use the lettuce leaves as salad cups, and you'll get extra heart-healthy vitamin K. But skip the rice; it tacks on extra calories without adding much nutrition. 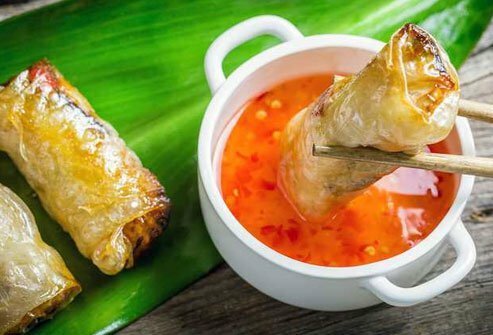 This dish is a menu staple of Thai restaurants. 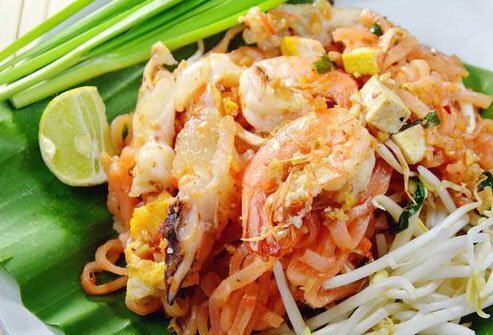 It's made from rice noodles sauteed with spices, peanuts, egg, and bean sprouts. Get it with shrimp, chicken, or tofu for lean protein, and extra veggies for fiber and vitamins. 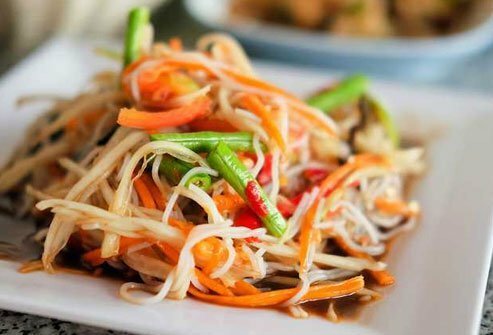 Just watch your portion: Pad thai clocks in at 300 to 400 calories a cup. Some restaurants' entrees are three or four times that. 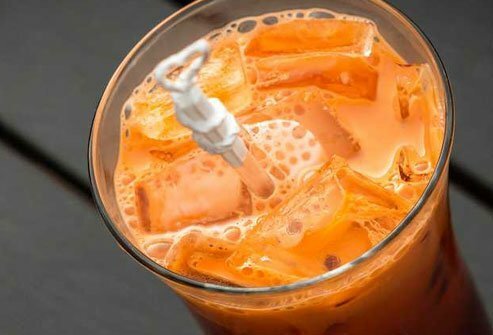 This drink gets its sweetness from sugar and condensed milk. The result: a 16-ounce serving that can pack in more calories and sugar than a cup of ice cream. If you're in the mood for tea, order a glass of the unsweetened kind. Along with the refreshing flavor, you'll also get a health boost. Both black and green tea have disease-fighting antioxidants. These often pair protein with veggies, like tofu with broccoli or basil chicken with string beans. That means you'll get vitamins and minerals, along with protein to stay satisfied. Order the dish with brown rice instead of white, and you'll get an extra 2 grams of fiber per half-cup of rice. Because the sauce usually has sodium, fat, and sugar, ask for it on the side. In the mood for fish? Steer clear of "crispy" or "fried" dishes. That's code for deep-fried in oil, which means it has extra fat and calories. 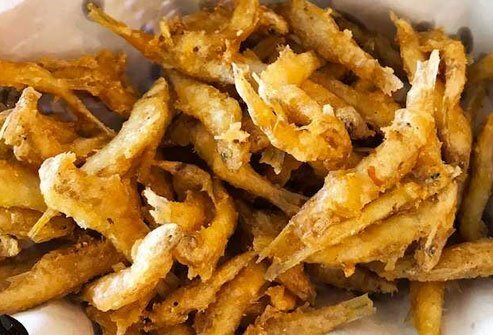 One study found that people who ate fried fish more than once a week were 44% more likely to have a stroke, compared with those who had it less than once a month. Do your health a favor and order your fish steamed, baked, or broiled instead. 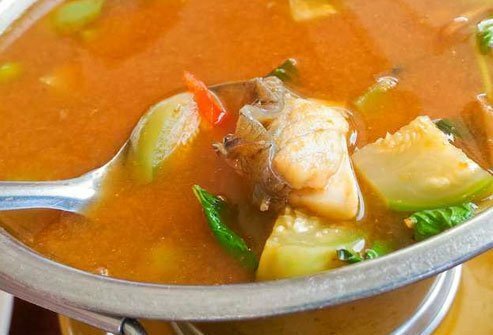 Most Thai curries are made with creamy coconut milk, but this one uses water, broth, or stock, so it's lower in calories and fat. Order the tofu, chicken, or seafood version with brown rice for extra fiber. If you can handle the heat, get it spicy. A compound in chili peppers called capsaicin may help protect you against cancer and heart disease. A fruit dessert is healthy, right? Not always. This version, called "gluay kaeg," takes banana slices and dips them in a sweet coconut batter. Then they're deep-fried in oil. If you're in the mood for something sweet, go with the fruit sorbet or sticky rice instead. 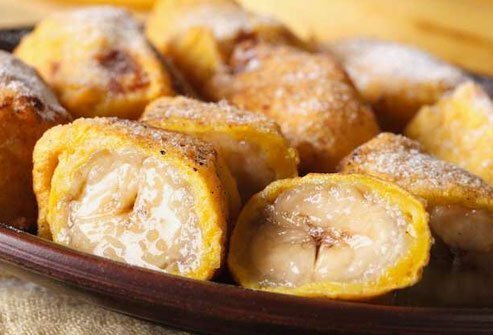 While those desserts have added sugar, they're lower in fat than fried bananas. Cleveland Clinic: “Your Best Bets and Smart Swaps for Eating Ethnic Food.” Mascha Davis, registered dietitian; spokeswoman, Academy of Nutrition and Dietetics.